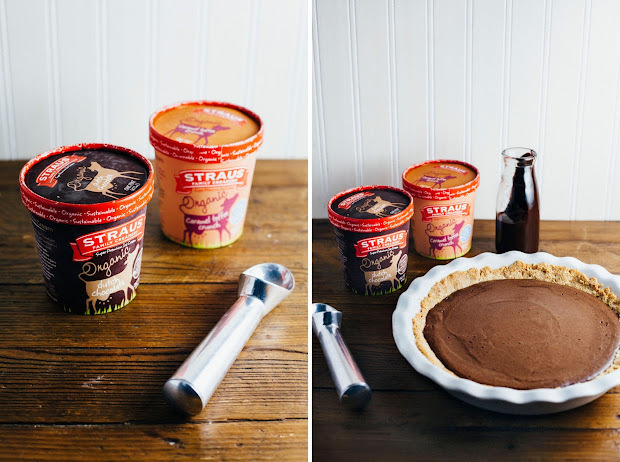 This weekend, I had a craving for a brownie, an ice cream sundae, and a pie — and that's how this epic dessert was born. I'm not kidding. I'm usually not one for combination desserts, but this was one hankering I couldn't fix. Probably because I'd pulled a muscle in my back during a Crossfit workout and had spent the week sitting around watching a terrifying amount of Netflix (a.k.a "recovering") instead of doing my usual daily workouts. Doing nothing always makes me eat more terribly than getting up and exercising. And I knew that this was the last week that I could indulge in dessert since my friends and I had inexplicably committed ourselves to a juice cleanse the following week. So I decided, what the hell, I was gonna go for it. Next up, of course, was ice cream. I was lucky enough to have a freezer full of Straus Family Creamery ice cream. I first found out about Straus Family Creamery when I was living in San Francisco. One of my good friends, Vikram, loved getting some cookies and a bottle of their milk as a cure for when he'd had too much to drink the night before. I was always slightly weirded out by this (since I tend to like greasy foods like eggs and bacon and burgers to cure my hangovers), but I wasn't going to deny myself some cookies and milk. It was then I discovered how delicious Straus Family milk was. I don't know what they do exactly, but the milk tasted creamier and silkier than other milk I'd ever had — it certainly didn't hurt that each bottle had a generous helping of cream sitting up top the milk, which we would then stir into our coffees. Sometimes, if we were being super indulgent, Vikram would actually eat the cream by spoonfuls. Oh, those were the days... the ones where we still had decent metabolisms. In any case, Straus Family Creamery's PR agency reached out a few months ago and sent me a generous wad of coupons to use for my baked goods. 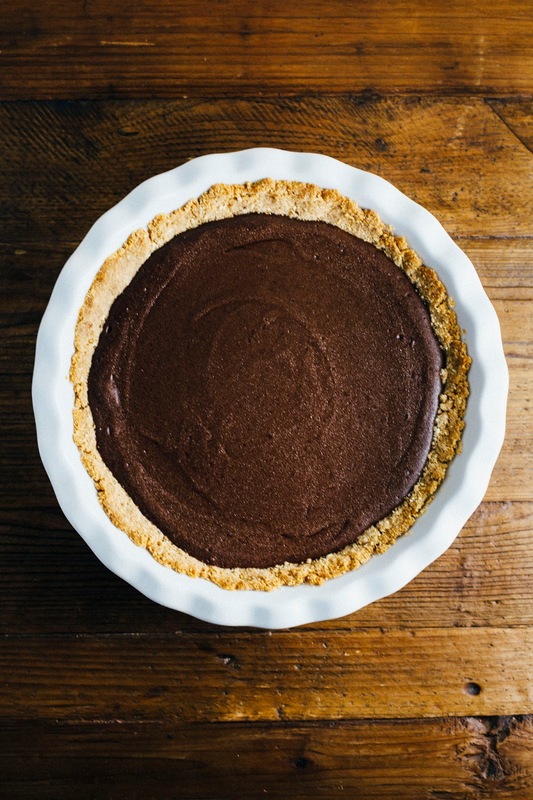 I've been using Straus Family Creamery's European style butter and cream in some of my more recent recipes (like in the all-butter crust for this Meyer Lemon Chess Pie or the cream for this Earl Grey panna cotta recipe), and I will say that I have noticed a big difference. My pie crust came out significantly more buttery and flaky, while my panna cotta was incredibly silky and creamy... so it's definitely true that good food starting out with good ingredients. When I brought the pie down for my roommates to enjoy, one of them actually audibly gasped. We stared at it wordlessly for a few moments, in awe of the thing. The brownie filling managed to be light and airy, despite being rich and incredibly indulgent; it had a similar more akin to mousse, and complimented the creamy ice cream and salty graham cracker crust well. 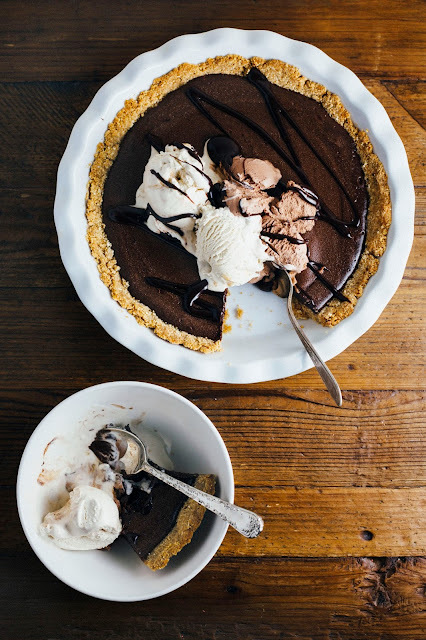 The warm fudge topping was just like the old fashioned fudge you could get at ice cream parlors — the kind that would harden when poured over the cold of the ice cream, giving the pie an awesome contrasting texture. This was the brownie, ice cream sundae, and pie I was dreaming of all right — the perfect send off for the week of juice that greeted me ahead. The first iteration of this recipe was wayyy too sweet. 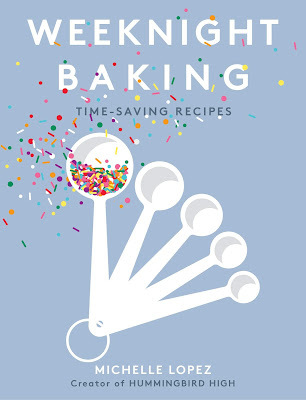 I love Christina Tosi, but sometimes the baked goods in the Momofuku Milk Bar cookbook err on too much of everything. I ended up cutting some sugar from her graham cracker crust recipe, and adding a lot of salt to the fudge sauce to cut out the sweetness. The additional salt to the fudge recipe was absolutely genius, cutting down the sweetness of the brownie and ice cream. But if you think the combination of chocolate and salt is too out there, feel free to reduce the recipe quantity from 1 teaspoon to just 1/4 teaspoon. Staus Family Creamery products are available in Whole Foods and other fancy grocery stores that focus on organic foods. The flavors I used in my pie are Dutch Chocolate and Caramel Toffee Crunch. I also adore their Brown Sugar Banana ice cream, but I'd finished most of the pint and didn't have enough left to add to this pie. Big thanks to Straus Family Creamery for setting me up with samples! Combine 1 1/2 cups graham cracker crumbs, 1/4 cup milk powder and 1 teaspoon kosher salt in a medium bowl, whisking together until well combined. In a liquid measuring cup, whisk together 4 tablespoons unsalted butter and 1/4 cup heavy cream. Add to the dry ingredients (from the 1st step) and use a rubber spatula to toss again until the mixture comes together — the butter and cream will act as a glue and create small clusters. Transfer the clusters to a 9-inch deep pie plate and use your fingers and the palms of your hands to press the crust firmly into the pie plate, covering the bottom and sides of the pan completely. The crust is easiest to mold just after mixing. Set aside as you make the brownie truffle filling. Combine 4 1/2 ounces dark chocolate and 6 tablespoons unsalted butter in a double boiler (you can make your own double boiler by setting a heatproof bowl over a pan of boiling water, making sure the bottom of the bowl doesn't touch the water) over medium heat. Use a heatproof rubber spatula to stir the chocolate and butter together, working until the mixture is glossy and smooth. Once the ingredients are completely melted, remove from heat and set aside to cool slightly. Combine 2 large eggs and 3/4 cup granulated sugar in the bowl of a freestanding electric mixer fitted with a whisk attachment. Whisk together on high for 3 to 4 minutes, until the mixture is fluffy, pale yellow and the mixture passes the ribbon test (detach the whisk, dunk it into the whipped eggs, and wave it back and forth like a pendulum: the mixture should fall in a thickened, silky ribbon shape that then disappears into the batter). Once the eggs and sugar have reached the ribbon state, replace the mixer with the paddle attachment. Pour in all the melted chocolate and sugar (from the 2nd step) and briefly mix together on the mixer's lowest speed, before increasing the speed to medium and beating for 1 minute until the mixture is brown and homogenous. Scrape down the sides of the bowl. In a small bowl, whisk together 1/4 cup all-purpose flour, 3 tablespoons natural cocoa powder, and 1/2 teaspoon kosher salt, before adding to the entire mixture. Beat on the mixer's lowest speed for 45 to 60 seconds, until there are no clumps of dry ingredients — but be careful not to overmix! Scrape down the sides of the bowl again, before turning the mixer back on to its lowest speed and streaming in 1/2 cup heavy cream. Continue mixing for an additional 30 to 45 seconds, just until the white streaks of cream are fully mixed in. Pour the brownie batter into the prepared graham cracker crust. Place the pie tin on a sheet pan, and transfer to the preheated oven to bake for 25 minutes. The pie should puff slightly on the sides and develop a sugary, sparkly crust on top. If the brownie pie is still liquid in the center, bake for an additional 5 minutes or so, before transferring the pie to cool slightly on a wire rack. 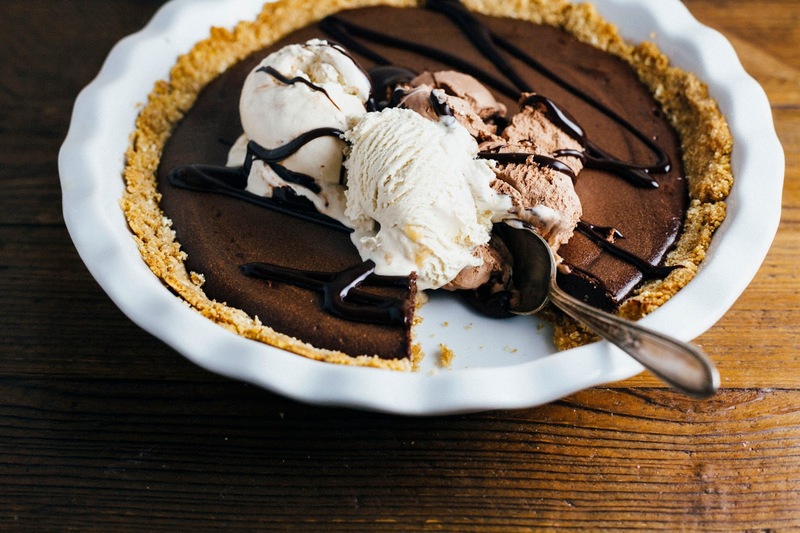 While the pie is cooling, make the hot fudge sauce. Combine 1 ounce finely chopped dark chocolate, 2 tablespoons cocoa powder, and 1 teaspoon kosher salt in a medium bowl. Set aside. Combine 1/4 cup heavy cream, 2 tablespoons light corn syrup, and 2 tablespoon granulated sugar in a heavy-bottomed saucepan. Bring to a boil over high heat, stirring intermittently. When the mixture boil, pour it into the bowl containing the chocolate. Let sit for 1 full minute. After the mixture has sat for a minute, slowly, slowly begin to whisk the mixture. Increase the vigor of your whisking every 30 seconds, until the mixture is glossy and silky smooth. This will take between 2 to 4 minutes, depending on your speed and strength. Use the sauce immediately. I've had a packet of Grahams in the cupboard since my trip to New York in December. I've been too precious with it because I really didnt want to waste it on something that wasnt going to..glisten on top?! I think this may be my Graham calling, thank you so much for sharing! And thanks for providing a recipe where you've cut the sugar levels, most recipes are far too sweet and I never know whats an appropriate amount to cut out. I love your blog! Oh good god, this looks so amazing. Definitely able to cure any sweet tooth! 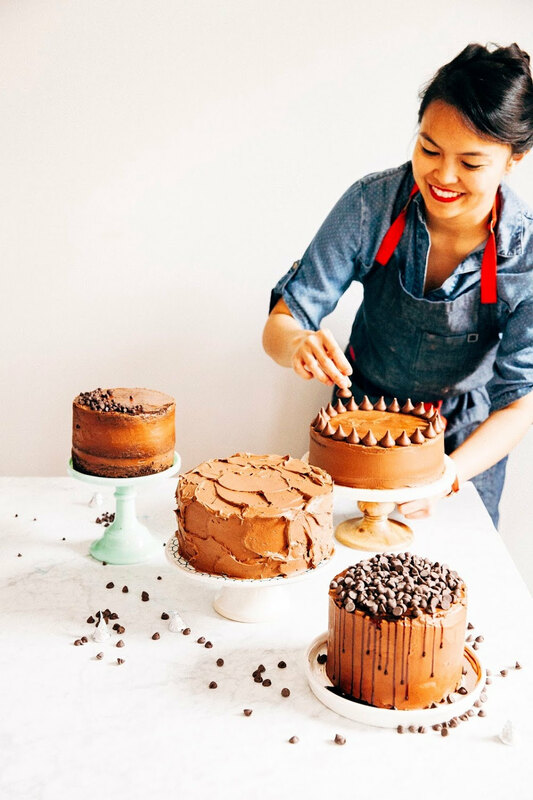 I can always count on your blog to make me hungry for sweets on my afternoon tea break! You've done it again. 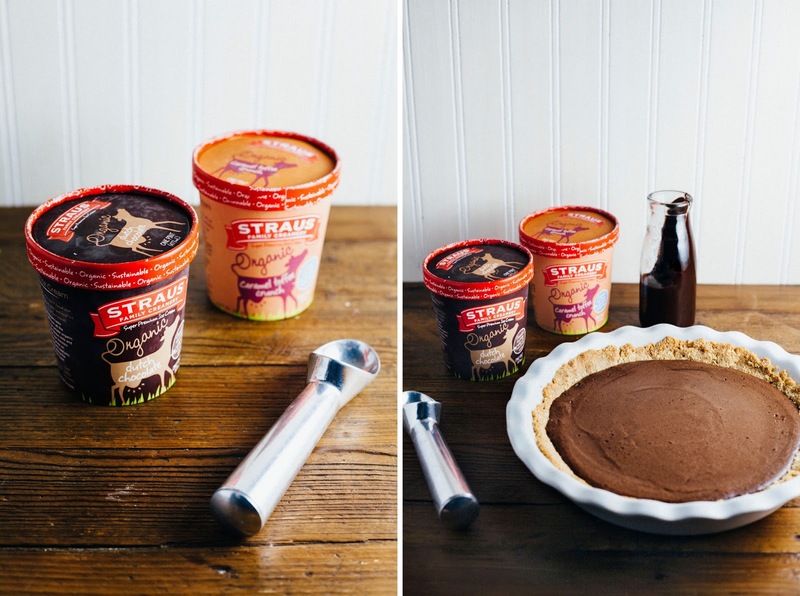 This looks fabulous - and I love brownie pie filling. This must be to die for! I. need. this. in. my. life. NOW. Oh my God. The brownie filling is so sugary that it glitters? That's how you know this is the one. I can't think of a more perfect dessert to go out on before your juice cleanse, ha. PS Like Emine said, I'm thrilled your version has less sugar. That's exactly how I feel about a lot of Momofuku Milk Bar desserts -- just a tad too much. Thanks for sharing this!! Sweet lord, yes. 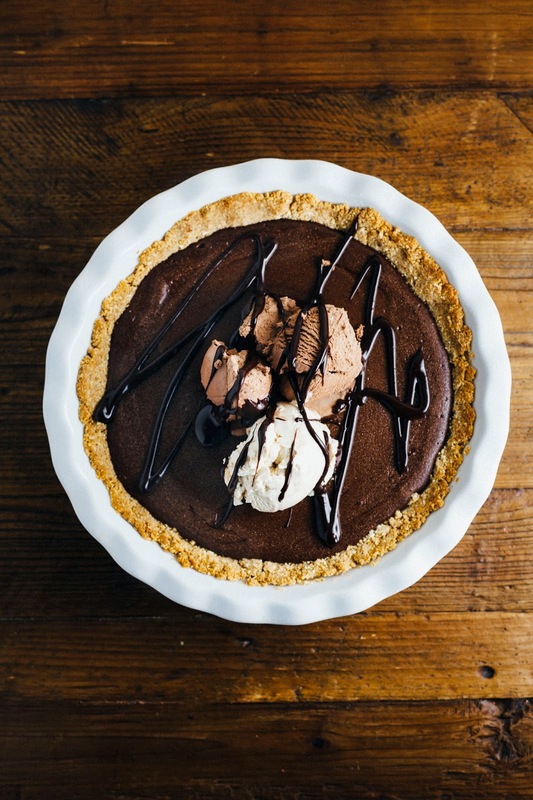 I want this pie. This post is killing me. It is insanely gorgeous! I feel similar about mash-up desserts but I'm pretty sure that this would be the exception to the rule. 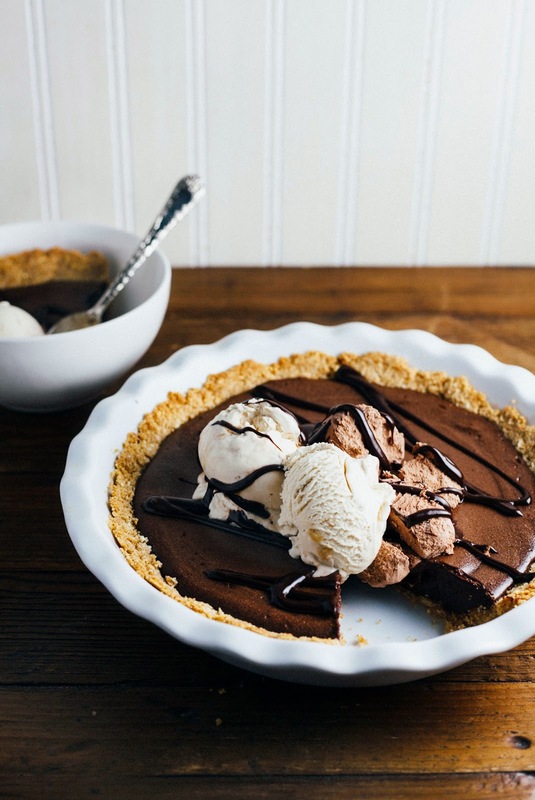 Sweet + salty + smooth + crunch + hot + cold = everything I love in one stunner of a pie. Man this looks too good… maybe I should try it this weekend before I go on a diet. hahaha.